Blame It on the Crane is a 1-vs-3 minigame from Mario Party 4. It returns in Mario Party: The Top 100. In close up on a wheel with Shy Guys in balls, a crane lowers, but fails to grab one. The scene zooms out as the crane raises and the wheel starts spinning, and the game begins. 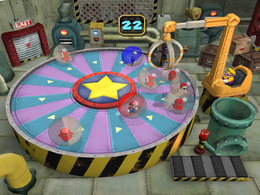 In the minigame, each member of the team is placed in a color-coordinated ball (which resembles Capsules and Orbs from later Mario Party games) along with about seven Shy Guys in similar balls. 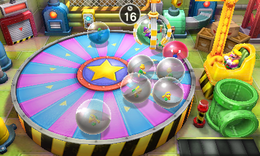 The balls and characters are on a large circular platform that spins counterclockwise. The solo player, positioned to the right of the platform, controls a large crane which must be used to capture the team as they pass. Grabbing a Shy Guy by mistake has no penalty other than naturally lost time. The team wins if any of its members survive for sixty seconds. In Mario Party: The Top 100, instead of Shy Guys, there are Koopa Troopas inside the plastic balls. In Mario Party 4, if the solo player wins, they will jump out of the crane and run to the center of the wheel and do a winning pose. If the three players win, the remaining players' balls disappear and they do their winning poses while the solo player just sits in the crane silently. In The Top 100, the relevant poses are instead done on the results screen. Rules – "One player uses a crane to try to capture the other three players. The other three must try to avoid the claw." Advice – "Grabbing a Shy Guy slows you down! Team players should hide among the Shy Guys to make it more difficult." Description – "Find out what it's like to be a toy in a crane game! Don't let the crane operator catch you!" On-screen (Solo) – "Catch all the capsules with your rivals inside!" On-screen (Team) – "Don't let the crane catch you!" The name of this minigame is derived from Milli Vanilli's song "Blame It on the Rain". This page was last edited on August 4, 2018, at 09:13.